As he walked, leashless, alongside his pet parents Saturday afternoon on Anvil Point, a cliff overlooking the English Channel, a Jack Russell Terrier named Spott spotted a rabbit. Spott’s pet parents immediately notified the Coastguard. Brown said Spott likely survived by landing in the sea instead of on the rocky shore. Spott even managed to swim to a ledge, where he was found by a recreational climber who had descended the cliff. The climber stayed with the lucky dog and comforted him until help arrived from the Royal National Lifeboat Institution (RNLI). “Spott was a bit shaken and had a few scratches, but otherwise seemed to be okay,” Becky Mack, a crew member on the RNLI lifeboat, told the Dorset Echo. 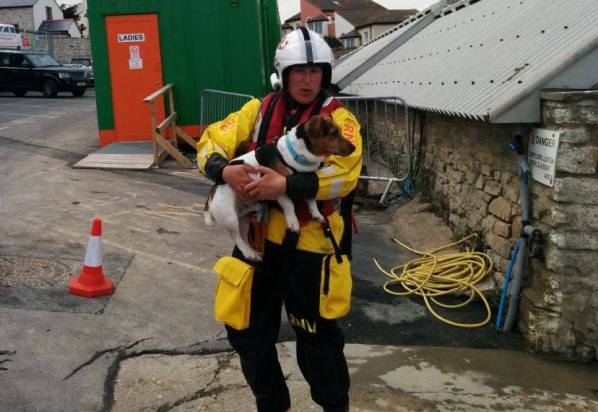 Spott was taken to the RNLI station in Swanage, where he was reunited with his very relieved pet parents. This near tragedy illustrates just how important it is to keep your dog on a leash, no matter where you’re going for a walk. “Always keep your dog on a lead while walking on the cliffs, as most dogs, especially smaller ones, cannot see the cliff edge,” the Coastguard advised in May 2014, when a Black Lab named Pippa also miraculously survived a 90-foot plunge off Anvil Point.